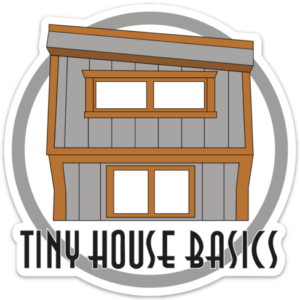 Downsizing to a tiny house you will automatically assume that you will use much less power that you ever did before, but how much do actually use when living in a tiny house? Here is our little Water Heater and Propane Tank “closet”. This setup provides easy access to our tank and hides it at the same time, it also provides protection for the on demand water heater next to it. On our first fill up on the big tank we started a log on the bottle to estimate our usage. as of now we pay about $22 a month in propane and plan for that cost to go down in the future. 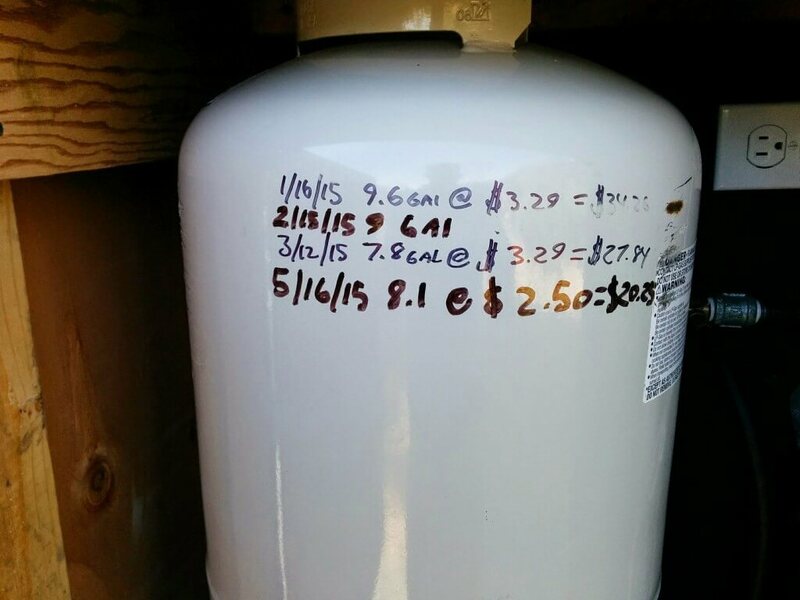 This also keeps track of the propane prices we pay. Following the price of propane is something we have never done but now we actively looks for prices just like standard petrol fuel rates. Here is our On Demand Water Heater, Eccotemp FVI-12-LP High Capacity Propane Tankless Water Heater. I admit it took a bit of time to fine tune it to the perfect temp but after that it has been working flawlessly and we highly recommend it anyday. 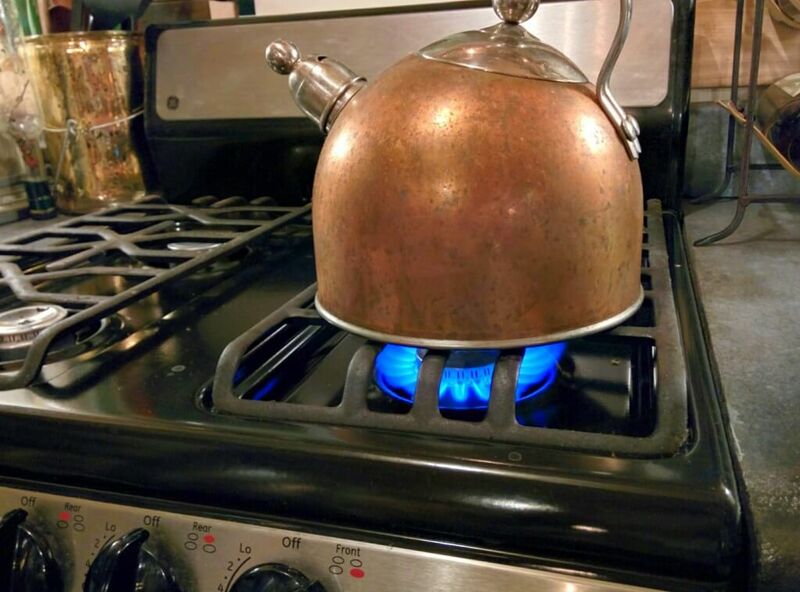 We use propane in basically 3 different way: Hot Water, Cooking and Boiling Water in the Tea Kettle. If you know my wife at all, you would know how much she loves coffee so the first duty of the day for the first person out of bed is to heat up a kettle of water for our french press coffee, no ifs ands or buts! We pour some water from the tap in the kettle and set it on the stove on high for about 8-10 mins til the water boils then we are ready for some french press. We realized that with just this little morning task, we end up using a good amount of propane during the month and we started to think of another way to heat up water for coffee and save a bit of money too. Using gas for boiling water is second nature to many campers out there because it is either that or the campfire so it was kind of like second nature to use this method for making coffee in the tiny house also. The other option we decided on was to get a electric tea kettle and see if we can save some propane during the course of the month and on top of that they are very easy to use and shut off when the water is done boiling, so we gave it a shot. 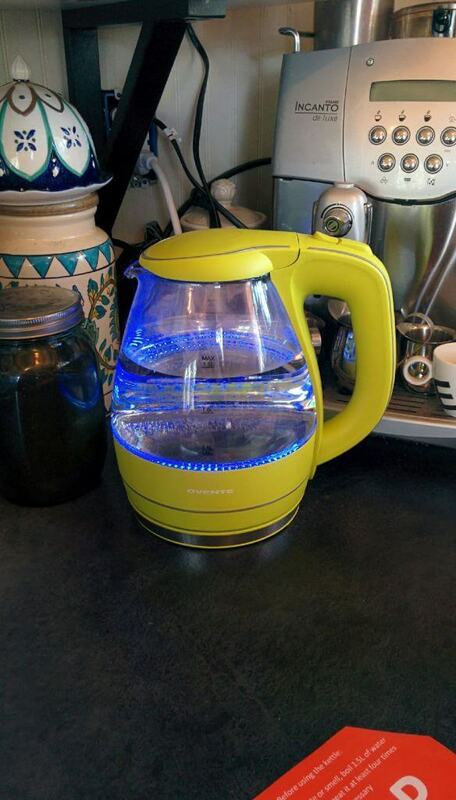 My Only Request for when we buy a tea kettle was for a glass surround so i can see the water boil, many of the lower priced ones under $50 do not have glass and therefore you cant see the water boil at all. 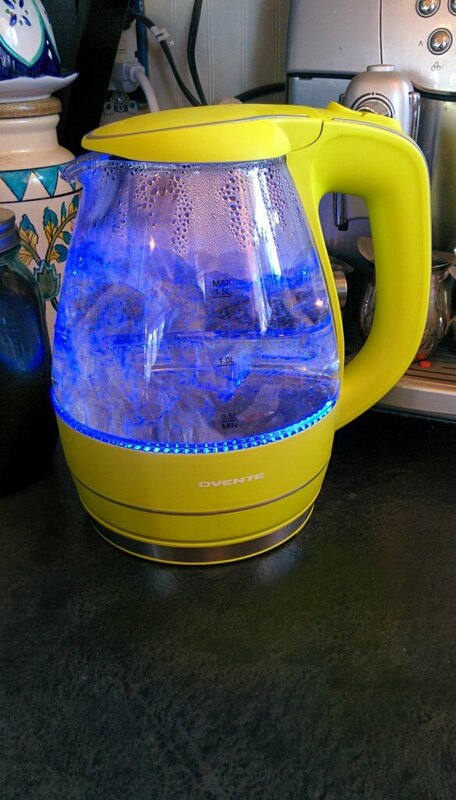 The Payoff: the Led Backlit Boiling Water. So far we have been please with this little kettle and plan to bring it with us when we go out of town (another benefit of a electric tea kettle when staying at hotels). Most importantly we look forward to see if this impacts our propane usage during the month because after all we will never shorten our hot water showers, there is just now negotiations on that! That’s very interesting. 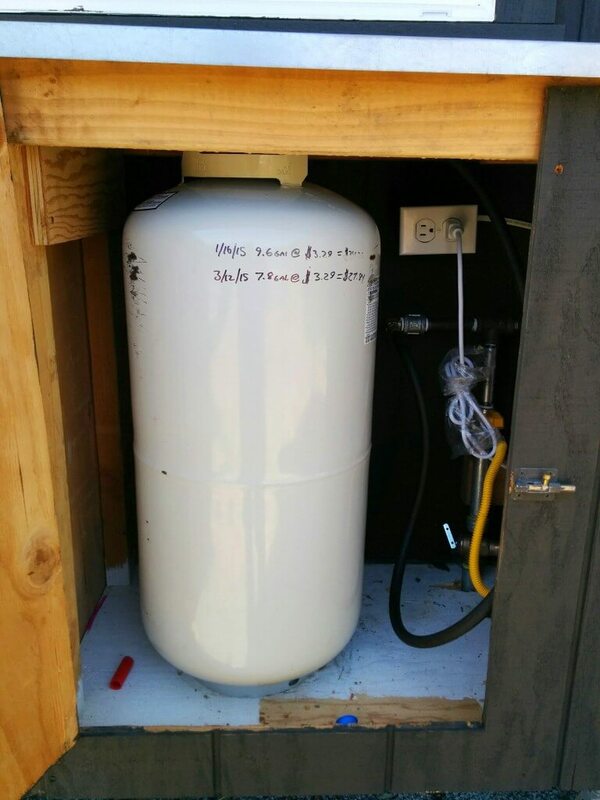 I’m actually debating whether I can go completely propane-less in my Tiny Home. To be honest, gas of any kind freaks me out a little…it could leak and catch on fire or cause an explosion, at least in my mind….I know, I know. So, I have been researching convection cook tops and electric on demand water heaters, wondering if the cost for electricity would be so much higher than the cost for propane? I already own an electric water kettle for my morning french press and evening tea 🙂 and plan on having one of those convection heaters on the wall. 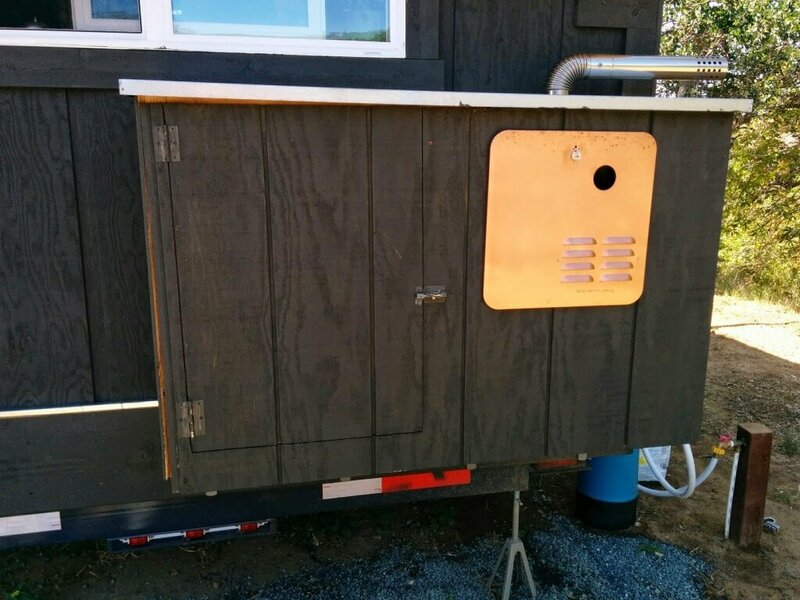 Having lived in a Tiny House for a while now and having the experience with propane, do you think I’m out of my mind for wanting to do everything electric? I think they fear of gas is a normal one and that is why i would recommend having a skilled plumber install all gas lines and pressure test for leaks to make sure you have all good fittings. Using electricity to heat water is very expensive and you will find your utility cost will sky rocket, Propane is more expensive than Natural Gas but it is still alot cheaper than using electricity for things like heating or cooking or drying clothes. nice write up…. 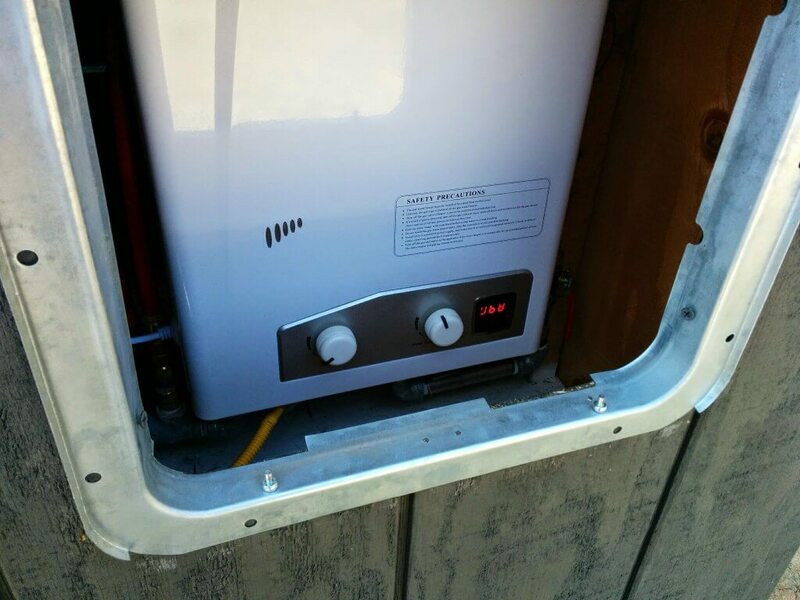 was just purchasing a eco-temp on demand water heater and was thinking that it had tobe installed inside and away from the propane tanks…. am i wrong about this? it seems to be the opposite of what your doing…. nice thanks for all the info…. love your TH one of the best out there…..
Hey Joshua. What climate do you live in? I was about to hang this exact unit inside a TH but i would much rather put it in a box on the out side if I could. I worry about it freezing. Is your box insulated? Hi Joshua. I’m wondering what stove and fridge you are using and how they are working out so far. 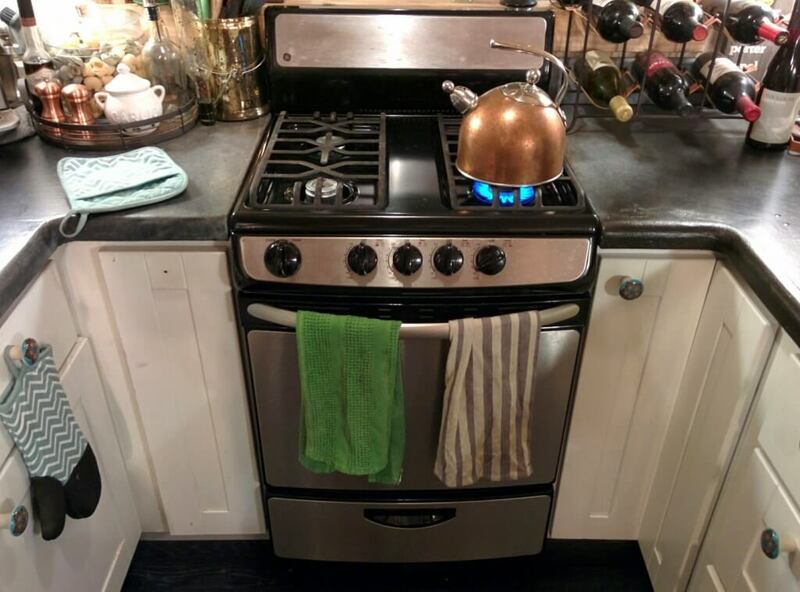 I like the look of your stove, but can’t tell what brand it is. Hello! Our Range is a 24″ Gas/Propane Range From GE, the retail is about $750 on it. it truly has been a awesome little range and we are extremely happy with it. The Fridge is a 10.7 Whirlpool Fridge/Freezer, it also has been great and even with the smaller than normal size we have adjusted quite well to it. Thanks for the reply. I appreciate it very much. I’m definitely going to look into the stove and fridge. Deciding on appliances is so tough for me! Thanks again! PS If you any advice about what NOT to do or what you’d do differently, I and I bet others, would love to hear it. Be well. Your question is pretty vague, in regards to what are you asking? Yeah, you’re right, it is, but I don’t know anything about this so I’m interested in everything. And we start building next week! Yikes! Don’t buy the stove with the electronic igniter because it uses tons of electricity. I wish I’d used steel instead of aluminum in the shower. If I had to do it again I would install fewer but larger windows. Ventilation is super important. Be sure all or most of your windows open. Remember to plan where you’ll put your dirty clothes. And thanks again for the stove and fridge info! Incorrect on the statement about the electronic igniter, if used everyday the energy usage only amounts to less than 1 Kilowatt, still less than a electric stove and still less than a gas stove with a pilot light. I dont understand the statement about using steel in the shower? as in the shower surround? the only benefit steel would have would be price and gauge available, aluminum in a wet environment will not rust like its steel counterpart, steel can be galvanized but galvanized steel is only a sacrificial layer and will rust eventually but that process takes many years. I agree with Most of the windows opening, if you cant reach a few of them, why make them open? we have 13 windows in our tiny house and only 2 are picture windows. If i was only to give one piece of advice in the design of a tiny house i would say AVOID Hallways, any area that funnels the space into a hallway shape (i.e. a bathroom on the same end of a house and divided by a wall). hallways are very prevalent in Tumbleweed designs and they make the space feel even smaller than it is. I have a question about your propane tank. Do you take it to get it filled each month or do you have someone come out and fill it? I am looking to do a gas tankless for one bathroom in my house and the gas company will only sell one that is 60 gallons and they charge a minimum of $20 on top of the cost of the gas to fill it up plus I have to pay for installation. We remove the 10gallon tank and get it refilled every month or so. That rate of $20 service charge does not sound bad at all considering the side of tank you can get. Hi. We have a two story 500 sf (approx 250 sf per story) tiny house that is just a shell right now. I have read that using propane, especially for heating (it’s in Nova Scotia), causes interior condensation problems. What are your thoughts? If you are using a propane heat source it should be vented to the exterior. we use propane for cooking but its not being used regularly so the condensation is create directly from its use is quite little. Hi. I have purchased the same water heater from Ecotemp for my tiny house and am preparing to run propane lines to both the WH and a 2 burner cook stove. Any tips for propane line installation and fine tuning the FVI-12 LP? Good to know that you recommend this unit. after two years of use with the FVI-12-LP it is very finicky, every season we need to readjust it and will probably plan to upgrade it in the future. it has worked well but it is very hard to dial in the right temperature. what climate do you live in? are you worried about the water heater freezing at all? I just purchased the same one, it is bigger then I thought so we are very limited as to where to put it. We live in Northern California. we have not have any issues with the water heater freezing, we have a pretty mild climate. what type of climate are you in? hopefully you dont have freezing issues with the same unit. What kind of propane regulator do you use? Will one from a grill work? It’s interesting that you use propane just to heat water and to cook with. It seems to me that propane could potentially be a good way to heat up a home especially if it is on the smaller side. This kind of gas is particularly effective and is pretty stable so it could be a great way to stay toasty in the winter. I’m curious about hot showers. If I can ask, how long are they, what is the gas consumption per shower? How big is the cylinder you use to feed the house? We take lots of hot showers, not sure about consumption per shower but a bbq sized tank will last us about a 3 to 4 weeks. It’s great to see propane being used in a tiny house. My wife and I want to try and move into a tiny house soon, and propane seems like a great choice. If it powers your hot water and cooking, that covers pretty much everything. So how do you power your Split AC unit?? Do you use gas or solar to power it? And if it does you solar energy how much power does it consume on each use? Sorry for all the questions 😅 and thank you. We are looking at building a tiny house. Wanting to use propane if possible. We love to cook/bake and husband enjoys his hot baths. Would a 10-20 gal propane tank be feasible? Also how does the on demand tankless water heater work? Will it be able to service shower and sink? Only husband and I will be living in the tiny house. Ideally the larger the propane tank the less you will have to refill it. a 20pound tank will last about a month for us. I totally agree when you said that propane gas is usually the first thing that campers think about when they need a source of heat and for cooking. I will actually use that kind of gas as well when I have my own mobile home for camping as well. We should look for a company we can trust as early as now because our mobile home will be done soon. It will be done at the end of March to be exact.